Timeless Garden Rooms were recently commissioned to replace an old conservatory with a highly insulated garden room that could comfortably be used all year round. The customers live in a Listed Building so a planning permission application needed to be made before any changes could take place. The Timeless Garden Rooms team dealt with all the planning details for this project, liaising with the Local Authority on their client’s behalf. The planners stipulated a few conditions for approval, including the colour of the exterior paintwork and that the windows used be in the same Georgian style as those on the main house. There was also a requirement that an old well that sits right in front of the intended building site be preserved. Unlike replacing the conservatory with a brick building, the traditional timber frame building could be built upon unobtrusive foundations. This meant that the largest possible building could be built without affecting the integrity of the Listed Building and the old well the site sits within. Permission was granted that the garden room could be built just inches from the main wall of the house, giving the impression of it being an extension rather than a standalone building. 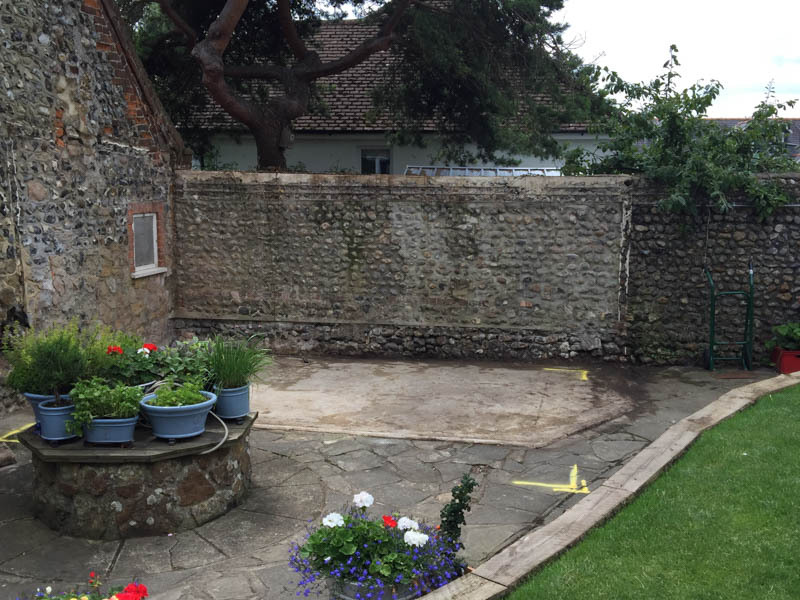 Once the project had planning approval, the Timeless Garden Room team set about dismantling the old conservatory. Care needed to be taken during this process so as not to damage the fabric of the Listed Building and well. The resulting building is classic Timeless Garden Rooms. It features a beautifully tiled Cedar shingle roof with decorative bargeboards and finials at each gable end. Traditional weatherboard cladding has been fitted on the exterior walls, which has then been painted in the Local Authority approved muted green colour. Georgian windows have been fitted as per the planning consent. A wide window has been positioned close to the house and above the Listed Well, with a set of half glazed French doors alongside. We love how Timeless Garden Rooms take the time to install the traditional lead dressing under the windows, details like this really count! The building is to be used as a music room. The customer wasted no time once the building was completed to furnish the room and fill it with their instruments. A fully insulated music room like this can be comfortably used all year round, with the peace of mind that your instruments are stored in the best of conditions. Timeless Garden Rooms customer is understandably delighted with the results. They found it particularly useful that Timeless Garden Rooms handled the planning process for them, acting as the buffer between them and the Local Authority. They also found dealing with one company for the removal of the conservatory to the completion of the new garden room, offered peace of mind, allowing them to sit back and watch the project evolve. To learn more about Timeless Garden Rooms traditional style buildings, give them a call on 01843 821 851 or take a look at their website.